The Comptroller of the Currency is now warning about a worrisome concentration of development and construction loans among community banks. According to their website, "The Office of the Comptroller of the Currency was created by Congress to charter national banks, to oversee a nationwide system of banking institutions, and to assure that national banks are safe and sound, competitive and profitable, and capable of serving the banking needs of their customers in the best possible manner." Comptroller of the Currency John C. Dugan told a bank conference today that the OCC (Office of the Comptroller of the Currency) is focusing increased attention on problems arising from high community bank concentrations in commercial real estate (CRE) at a time of significant market disruptions and declining house and condominium sales and values. “The combination of these conditions is putting considerable stress on one particular category of commercial real estate lending: residential construction and development – and other categories of CRE loans will feel similar stress if general economic activity slows materially,” Mr. Dugan said in a speech before a meeting of the Florida Bankers Association. In the area of construction and development (C&D) loans, nonperforming loans in community national banks amounted to 1.96 percent of the total at the end of the third quarter, double the rate of the year before. The OCC expects banks with CRE concentrations to make realistic assessments of their portfolio based on current market conditions, and to make necessary adjustments as market conditions change. Can't sell your home? Try swapping it. The concept of trading homes temporarily for vacations has long existed, but now it's being adapted to the slumping real-estate market as people, particularly in the Sunbelt and other slow spots, scout for ways to unshackle themselves from their property. Anecdotal evidence suggests the number of people doing this is still relatively small, but it has popped up from virtually nothing in recent years. Experts say it's probably best not to get involved with someone who owes more money on their house than what it is worth -- because they could have a tough time getting financing. And the transaction itself isn't without challenges. OnlineHouseTrading.com recommends that both clients use one title company that knows not to complete the deal "until everyone signs off." Daniel Westbrook, the co-founder of the company says, "the scariest thing that could happen is that you buy someone else's house and they don't buy yours." Both sides of a swap transaction typically close simultaneously -- taking away the risk of being saddled with two mortgages at once, or of having to borrow more after purchasing a new home because your old house didn't sell for as much as you thought it would. When swap partners meet directly online they also save on brokers' sales commissions -- usually 4% to 7% in most markets. If there are homes of unequal value, one buyer provides the cash or gets a mortgage to make up the difference experts say. Developers in the weak market are getting into the act, trying to unload new homes by offering to buy peoples' older, less expensive ones -- essentially taking trade-ins like car dealers. Developers say that they do have to then worry about selling the trade-in home, but it is more important for them to avoid getting stuck with a new subdivision of empty homes, which is bad for their image and their wallet. Developer Florida Lifestyle Homes in Daytona Beach says it will buy homes of people who will "trade up" to a new home that has a value at least 20% greater than the one they're in. 1. We will stop your mortgage company from calling you. They will not be able to hassle you anymore. They won't be able to call you to collect! 2. You will immediately know the exact amount of days you have to live in your house payment free. We stay on top of your walk away plan and keep you up to date with weekly progress emails. We also will notify you if the lender is taking longer than expected subsequently giving you more time in your home payment free. 3. You will be enrolled in our affiliate credit repair plan. They have removed thousands of foreclosures from their clients credit reports. 4. You get a personal consultation with one of our highly experienced Real Estate Attorneys making sure the lender followed the law perfectly. If they did not, you may have a case against them. 5. You will have experienced foreclosure consultants available to answer any questions you may have during the entire process. 1. How does your Walk Away Protection Plan & Kit protect me? When you purchase a Walk Away Protection Plan & Kit we commit to helping you through the entire process. You will get over 50 years of combined Real Estate and Law experience to help you know and understand your rights. If You qualify for our Plan, your lender WILL NOT be able to call you in attempt to collect. Your lender WILL NOT be able to collect any deficiency or loss they may receive by you walking away. You WILL be able to stay in your home for up to 8 months or more without having to pay anything to your lender. It's important to act now before it's to late. 2. Will I owe any money to my lender? A. If you qualify and follow our steps, you shouldn't have to pay anything. 3. Do I have to file Bankruptcy? A. No you don't have to. In many cases you can keep the rest of your credit in good standing and we can help you improve your score over the next 6 months. 4. Should I hire an attorney? A. There are certain circumstances when an attorney is needed, however, hiring an attorney can be expensive with retainers and high hourly fees. With our Walk Away Protection Plan & Kit, we correspond with your lender if needed and we teach you, so you can do it all yourself. Attorneys have helped us put together our Walk Away Protection Plan & Kit so it contains information that attorneys may give you anyways. This alone can save you thousands of dollars. 5. How long until I can buy a house again? A. Lenders typically like to see 4 years since the foreclosure was discharged. However, Fannie Mae (government loan agency) currently requires only 2 years. Before you know it, you will have this behind you and a fresh start! 6. How long will a foreclosure last on my credit? A. Lenders usually look back 7 years. It will remain on your credit report for that long but the effects will diminish each year. And all this for the low, low price of just $995 (payable in 3 easy payments!). Of course what will the long-term ramifications of this be? Home loans will be much tougher to get for everyone in the future. But someone certainly saw the opportunity and went for it. But the biggest obstacle to stopping a foreclosure, Freddie Mac (FRE) says, is the frequent failure of lenders or loan servicers to make contact with the homeowner in the first place. "When we go into a house that's been foreclosed to clean it out, we find stacks and stacks of letters from the servicer that have never been opened," says Robin Stout Migala, senior manager of Freddie Mac's loss mitigation team. "Many just think the servicers just want to take the house back, which, of course, is not true." Source: Freddie Mac/Rober telephone survey results based on responses from 2,411 homeowners, including 1,004 delinquent borrowers more than one month late. Survey conducted Oct. 23- Nov. 14; margin of error: �3.0 percentage points. The FBI is conducting 14 criminal investigations of mortgage lenders and the firms that turned their high-risk loans into complex securities that have left investors worldwide with huge losses, a top official at the federal agency said Tuesday. "We're looking at the whole range of those involved -- including the investment banks and other entities that bundled the loans up for sale and the institutions that held them and reported [to investors] on their value," Neil Power, head of the FBI's economic crimes unit, said in an interview from Washington. In another development that came to light Tuesday, a fired loan officer alleged that a joint venture between No. 1 mortgage lender Countrywide Financial Corp. and Los Angeles-based builder KB Home improperly inflated home appraisals and falsified incomes to put borrowers into homes they couldn't afford. Countrywide, which is being acquired by Bank of America after reporting a $1.6-billion net loss for the second half of 2007, said it had investigated the claims in a wrongful termination lawsuit filed by Mark Zachary, a former regional vice president for the joint venture in Texas. In a statement, the company said it "found no merit to his accusations" contained in a complaint filed in U.S. District Court in Houston. Whether this more aggressive approach to monetary easing will prove sufficient to keep the economy out of recession is difficult to say, particularly given that monetary policy operates with long and variable lags and the credit crunch and the housing correction have yet to run their course. Much will depend on the health of the labor market and the ability of consumers to grow spending at a pace sufficient to offset weakness elsewhere in the economy. –Joshua Shapiro, MFR, Inc. The United States economy expanded by a disappointingly weak annual rate of 0.6 percent during the last three months of 2007, the government reported Wednesday, offering the latest indication that the United States is already suffering a substantial slowdown, and perhaps a recession. The focus now is on what lies ahead. Policy makers and investors are looking to a snapshot of the nation’s employment situation scheduled to be released on Friday. But in recent days, fresh signals have suggested that the job market may not be deteriorating. New claims for unemployment have been dropping since mid-December. On Wednesday, the ADP National Employment Report, which tracks changes at companies with payrolls overseen by ADP, reported that the economy added 130,000 new private sector jobs in January. The Federal Reserve cut its key interest rate another half point to 3% today, completing a wild eight-day run during which the central bank slashed the rate more than at any time since 1990 in an effort to stave off recession and what it fears could be an economy-damaging credit crunch. In a statement explaining their latest move, Fed policymakers cited financial market conditions as remaining "under considerable stress" and warned that "credit has tightened further for some businesses and households." They also said that "recent information indicates a deepening of the housing contraction as well as some softening in labor markets." Analysts said that policymakers' focus on markets indicated the extent of their concern about a financial freeze-up. Usually, the central bank goes to some length to avoid appearing to be responding directly to markets and investors, and instead emphasizes its attention on the broader economy. But policymakers have apparently decided that the combination of the sub-prime mortgage mess, a housing contraction and the repeated incidents of credit freezes pose a sufficiently serious danger to growth that they have to act decisively to reverse current trends. "This is certainly an aggressive move by the [policymaking] Federal Open Market Committee," said Gregory Hess, an economist, former Fed staffer and dean of the faculty at Claremont McKenna College. "It appears that given the situation they see unfolding, they've decided to put their concerns about growth ahead of any concerns about inflation," he said. "I think the Fed is bonkers," said Allan Meltzer, an economist at Carnegie-Mellon University who is writing the definitive history of the central bank. Fed policymakers "frequently swear to themselves and each other that they are not going to ease [interest rates] excessively and then the economy slows a little and they do just that," Meltzer said. Both plans focus on personal tax rebates and incentives for businesses intended to spur spending. The Senate plan also extends unemployment benefits for 13 weeks beyond the 26 weeks currently provided in most states — at a cost of $10 billion in 2008. Ms. Pelosi had initially sought an extension of jobless benefits and an increase in food stamps, but dropped those demands in favor of an agreement to provide $28 billion in one-time payments to more than 35 million families that would not otherwise have qualified for income-tax rebates. But on Tuesday, Ms. Pelosi said that her own support for some of the proposals being floated in the Senate was secondary to the urgent need to secure a short-term stimulus plan, without vastly increasing the national debt. • Bank of America stopped making loans through brokers in December. National City Mortgage, once a big player in "wholesale" lending through brokers, cut them off in December, too. Residential Mortgage Capital, based in Marin County, stopped working through brokers last week. Some big lenders have made the change to maintain more control and profits, experts said. • Non-conforming or "jumbo" loans are popular with local buyers, but they have been much tougher to get recently. Jumbo loans are those of more than $417,000 that are not purchased from lenders by government-sponsored financing companies Fannie Mae and Freddie Mac. Financing for jumbos instead comes from financial institutions and their investors, and it has tapered off dramatically since summer. • State bill AB 1830, introduced this week by state Assemblyman Ted Lieu, D-El Segundo, would among other things ban a form of compensation paid to brokers by lenders called the "yield spread premium," which critics say usually amounts to kickbacks for steering buyers to high-interest rate loans. Brokers say it's legitimate compensation that allows borrowers to avoid paying closing costs or points. • HR 3915, which passed in the House of Representatives in November, would create a national registry and licensing system for loan "originators," including brokers, and require background checks and education requirements. Originators would be prohibited from directing borrowers to loans they cannot afford. It is now easier for developers to purchase surplus property from the California Department of Transportation if the property is used to develop affordable housing projects, Caltrans announced Tuesday. Caltrans has been identifying and disposing of surplus properties acquired for transportation projects but no longer needed. It has teamed with the California Department of Housing and Community Development to facilitate the purchase of those projects by developers. The joint effort "is a tremendous step towards expanding the availability of land, which is critical to increasing the supply of affordable housing in California. It's a great example of how we can make more progress through greater collaboration among our transportation and housing agencies," Dale Bonner, secretary of Business, Transportation and Housing, said in a prepared statement. More information is available at dot.ca.gov/property. 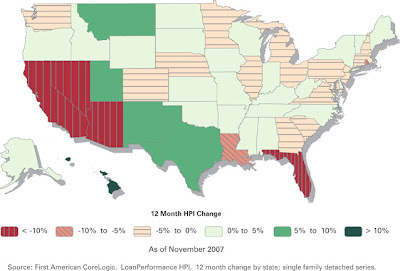 As noted on the Lansner on Real Estate blog, the latest S&P/Case-Shiller index shows price declines of 8.6% for the 20-city composite during the annual period ending November 2007. The four steepest declines included those areas which participated in the run-up -- such as Miami and San Diego -- as well as the troubled economic area of Detroit. Although prices in the combined Los Angeles/Orange County area fell by just under 12%, they held up much better in the San Francisco area, falling by 8.6%. At the same time, prices in Portland and Seattle actually rose by 1.3% to 1.8%, respectively. That filing would place under bankruptcy protection the parent company in the United States and all branded home building operations, which include Newmark Homes, Trophy Homes, and Engle Homes. However, TOUSA's title, insurance, mortgage, and information services subsidiaries are not included in this filing, and TOUSA's CEO, Tony Mon, emphasized that there would be "no interruptions in services" under Chapter 11, and that the company would meet all of its warranty obligations. Although politicians have been trumpeting the increase in U.S. homeownership levels over the past few years, we now know that much of that increase was built on financial quicksand that would be unable to stand the test of time. And homeownership is important: it means more stable neighborhoods, as owners are more invested than renters and helps people plan more for a longer time horizon (at least in theory). The Census Bureau report showed that home owners accounted for 67.8% of occupied homes in the fourth quarter, down 1.1 points from a year earlier. It's the largest year-over-year drop recorded in the report. "It's an incredible story," said Dean Baker, co-director of the Center for Economic and Policy Research. 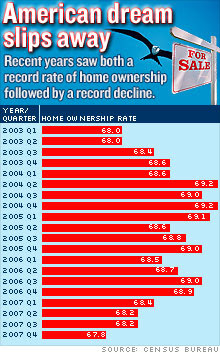 "We're back to where we were in 2002, which is before the subprime nuttiness and run-up in prices. And it's not clear how much farther we're going to fall.".. "The vast majority of those switching from ownership to renting are foreclosures or those forced to sell because they can't make the payment," said Baker. "What's really striking is we should have seen a rise of ownership because of the demographics, with all the baby boomers entering their peak home ownership years. Instead, we're seeing it fall quite a bit." Housing stocks turned higher Monday, continuing a week of gains. Beazer Homes USA Inc. (BZH, Fortune 500) led the winners, adding 83 cents, or 11 percent, to $8.04. Volume builders such as Pulte Homes Inc. (PHM, Fortune 500) edged up about 1 percent. The optimism comes as an increasing number of analysts suggest that lower prices may spur buying in 2008 after two years of steady and sometimes precipitous declines. Oppenheim expects that rate to fall as low as 550,000 in some months of the current year as companies ease back from building. That helped prices in December drop 10.4 percent -- bad news short-term for homeowners and builders, but necessary to restore a balance between supply and demand. "We expect existing inventories to continue to increase through spring, but less construction activity should begin to work down inventory later this year," he said. Another group of countries is bailing out the United States in a different way. The past few years have been very good to the world's energy-rich lands—Kuwait, the United Arab Emirates, Saudi Arabia, Norway. Add to the list China and Singapore; they may not be big oil exporters, but they still have huge surpluses. These vast savings have to go somewhere, and sovereign wealth funds—the investment arms of these nations—have provided infusions of cash to otherwise desperate American financial firms. Imagine what the U.S. economy would look like without these investments. Many of its most illustrious banks and financial companies would have gone bankrupt, triggering cascades of gloom and doom across America. The fact that there are large pools of capital available to shore up faltering giants might actually add substantially to the stability of the system as a whole. On the American campaign trail, the candidates talk about a world utterly unrelated to the one that is actually being created on the ground. The Republicans promise to wage war against Islamic extremists and modernize the Middle East. The Democrats deplore the ills of globalization and free trade, and urge tougher measures against China. Meanwhile Middle Eastern fund managers and Asian consumers are quietly keeping the U.S. economy afloat. More and more business people and economists think the United States and the rest of the world may be moving in different directions. "We're seeing a general decoupling," said James Owens, chairman of U.S. machinery giant Caterpillar. While demand is weak in the U.S., he says, "South America, Asia, Russia, Eastern Europe, all have very strong commodity-based exports. The fundamental economic health in these markets is strong." In addition, companies and consumers in these countries no longer rely mostly on U.S. financing to buy tractors and construction equipment. We've heard over the past few years that the U.S. churns out far fewer college graduates in engineering than in places like China, and has become a service-based economy that increasingly relies on consumer spending to keep growing. It is possible that the consequences of a "I want it NOW!" culture has sped up an inevitable transferring of economic strength to emerging countries? We will also be working with Fannie Mae and Freddie Mac to ensure that any increase in the conforming loan limit moves through their rigorous new product approval process quickly and has appropriate risk management policies and capital in place. ...at least two key Senate Republicans argue that it would be a mistake to change the limit without establishing a new regulator with the power to reduce the companies' massive mortgage holdings, now worth a combined $1.5 trillion. Multibillion-dollar accounting scandals at Fannie and Freddie in recent years brought demands for tighter government supervision and cuts in the companies' portfolios. Sen. Mel Martinez, R-Fla., a former housing secretary in the Bush administration, said a better compromise would be to extend loan limits for a much shorter period, say, 90 to 120 days. Then, those limits would expire unless lawmakers pass a long-delayed oversight bill, he said. "For a long time we have known these entities needed stronger regulation," Martinez said in an interview Friday. "They have the implicit guarantee of the federal government...If these companies were to go under, the Treasury would be in a terrible fix." While Senate leaders want to send the economic stimulus package to the White House by Feb. 15 for President Bush's signature, Democrats were considering adding more spending for the unemployed, food stamp recipients and states suffering budget crunches. If Democrats push for changes, that could give Republicans a chance to do so as well. In another sign that the new-home industry is getting hit harder than the market for existing homes, AP reports that in 2007 new home sales fell by over 26% versus a 13% drop in the existing home market. However, new home prices have remained (relatively) more resilient, edging up by 0.2% while existing home prices fell by 1.8%. For new homes, however, the pain was not evenly distributed, with a higher decline in the West (32.2%) and a small increase (1.6%) in the Northeast. Focusing on the "the foreclosure capital of the world" (Stockton, CA), 60 Minutes correspondent Steve Kroft took on the story of the subprime mortgage crisis on tonight's episode. Perhaps the most striking quote from Jim Grant 0f Grant's Interest Rate Observer is that total losses could exceed $1 trillion. The plan: This program, championed by President Bush and Treasury Secretary Henry Paulson, asks lenders to help borrowers with loans likely to cause the most foreclosures in the next few years: 2/28 or 3/27 mortgages. They have a fixed interest rate of, say, 7 percent, for two or three years and then adjust to much higher rates - up to 15 percent. With such a mortgage, an initial $1,995 monthly payment on a $300,000 loan would shoot up to $3,793. Under the plan, lenders would freeze the initial rate for an additional five years. To qualify, a homeowner must have a credit score under 660 and equity of no more than 3 percent. Supposedly, anyone with a higher credit score or more equity would be able to refinance or continue paying. Those who can't are stuck. Winners: Borrowers who qualify will see significant savings. The fallout: The plan will help only about 145,000 to 600,000 of the 2 million whose mortgages are to reset. And there's no assurance that they will be able to handle the new, higher payment five years hence. The plan applies only to mortgages that reset in 2008 or after. If your mortgage rate has already been hiked, no freeze for you. The plan: Proposed by Sen. Hillary Clinton (D-N.Y.), the program would halt foreclosures for those with subprime mortgages for 90 days to give them time to work out problems with lenders. After that, interest rates for anyone with a 2/28 or 3/27 loan would be frozen for at least five years. (Her plan excludes mortgages on investment properties or second homes.) After five years, people who still can't afford their rate adjustments would be allowed to apply for government-sponsored mortgages that they could afford. Losers: Lenders would have to swallow losses in interest. Taxpayers would pay to refinance loans for those still in trouble after the freeze lapses. The fallout: Forcing lenders to pay for a much bigger chunk of the mortgage cleanup will, in theory at least, reduce their willingness to make loans, particularly at the historically low rates prevailing for the past few years. With mortgages harder or more expensive to get, fewer people may be able to buy homes, causing prices to drop further. "We don't have enough credit right now," says Christopher Mayer, a Columbia University economist. "So the last thing you want to do is make lenders less willing to lend." The plan: Bankruptcy judges would have the power to modify the terms of a mortgage so that strapped borrowers could afford to pay, under this proposal from Sen. Richard Durbin (D-Ill.). Lenders would be forced to accept lower interest rates, stretched-out payments or even a decrease in the loan itself. Winners: Anybody who qualifies for a Chapter 13 bankruptcy - someone who has enough income to repay a portion of his debts - could see savings on a mortgage loan. Banks would be spared going to court to foreclose, evicting the homeowner and selling at fire-sale prices. Losers: Banks complain that they would lose out by accepting lower payments. But if a bank has to go to court to foreclose on a house, evicts the owners and then has to sell the property at a distressed price, it would have to accept lower payments anyway. The fallout: Writing down the cost of a loan is an efficient solution for the lenders, according to Chang-Tai Hsieh, an economist at the University of California at Berkeley. "But getting them to do it without a judge is very difficult." Lenders, however, have derisively labeled the bankruptcy approach the "cramdown" plan. And James Lockhart, director of the U.S. Office of Federal Housing Enterprise Oversight, believes it would encourage borrowers to gamble on loans they can't afford because they could eventually have them altered. "It raises an extreme moral hazard," he says. That seems unlikely. Few people would want to go through Chapter 13 bankruptcy, a traumatic process that would require them to live for five years on an IRS budget designed for tax cheats. Paying the mortgage is a whole lot easier. The plan: As it did in the Great Depression and in the aftermath of the savings and loan crisis, the government would set up a trust to buy and hold the mortgages of borrowers who couldn't repay their loans. The trust could modify loans, again, by stretching them out, reducing or freezing rates or lowering the amount owed. Ideally, borrowers would repay all the money over time and the trust would dissolve. Winners: Most borrowers, who should be able to keep their homes. Banks could use money that the government pumped into the market to make new home loans. Losers: U.S. taxpayers would face yet another fiscal woe, at least temporarily. The fallout: A study by First American CoreLogic, a real estate information company, estimates that the plan may cost about $120 billion over the next five years. And in the process the nation may have created a new group of government dependents. The government would have to ensure that lenders share the financial pain. Otherwise, they'd have little incentive to be more prudent next time the housing market heats up. And American public opinion has been clear about letting bankers off scot-free. Some 76 percent of the respondents to the CNN poll said that they wanted no helping hand extended to lenders. And what about mortgages for you? News about the rise in foreclosures has focused on so-called subprime borrowers people with low credit scores. They can't qualify for mortgages at all these days. But lenders have also tightened terms for people with good credit albeit gently. Here are the changes you'll see if you're shopping for a home loan. No more no money down Good-bye to 100 percent financing; you'll have to save up a down payment or get it out of your current home. Big banks like Wells Fargo now require a down payment of at least 5 percent of the property's value, and in markets where housing prices are falling, they insist on 10 percent. Want to renovate? You'll be able to get a home-equity line of credit or a second mortgage only if your equity is at least 10 percent of the value of the property. Jumbo loans get pricier A jumbo mortgage - that is, a loan of more than $417,000 - always costs a little more than a regular one, usually an extra 0.25 percent to 0.5 percent. The reason: Government-backed bond investors Fannie Mae and Freddie Mac won't purchase mortgages over that amount. Now private investors are backing away from jumbos too. If you need one, you'll pay a full percentage point extra, about 7.1 percent as of mid-December. Just in case you missed any of the top stories related to the housing industry over the past couple of weeks (which were numerous), you can quickly catch up with the latest edition of Peninsula Publishing's BuilderBytes newsletter. How real was the prosperity? The rule for a prudent individual is simple: Don't spend more than you make. For a long time, the U.S. economy obeyed that rule. As far back as the 1960s, personal spending, adjusted for inflation, has basically tracked the overall growth of the economy, as measured by gross domestic product. Sometimes consumers would get ahead of the economy for a few years, and sometimes fall behind, but never for very long. What could cage the bear? For better or worse, the trade-off for the next bull market could be that the U.S. turns into a happy hunting ground for foreign players. "Everything is very global," says Scott Martin, managing director of investments for Chicago-based Astor Asset Management. "There is a lot of money out there." It's the question bank regulators dread: Should they bail out a crucial bank if it collapses? With economic and market conditions sliding precipitously, risk is rising fast that at least one major institution could implode, endangering the financial system with it. The way the Federal Reserve and other government watchdogs deal with a blowout could determine how much damage is left by the current credit crisis. ...one thing is certain: Central bankers hate bailouts. In particular, they loathe helping an individual institution even more than they dislike creating general economic bailouts via interest rate cuts and increased government spending. Both, in effect, ratify the excesses that lead to a bust and encourage more wasteful behavior in the future. But deals for specific banks are especially bothersome because they pardon individuals for bad decisions. Here's the good news: Congress and the Bush Administration are working with remarkable speed to pass a fiscal stimulus package. Tax rebate checks could start hitting mailboxes by June. Observers have been impressed with the alacrity of the political Establishment. "I don't know if it will keep the U.S. out of recession, but if there is a recession, it should shorten its stay and limit its duration," says John Lonski, chief economist of Moody's Investors Service (MCO). By trying to engineer a brief consumption spurt, Washington could do too little for a seriously impaired economy. "You could have a bad first half of the year, get a temporary pop through the stimulus, and then go back to negative growth," warns Nigel Gault, chief U.S. economist of forecaster Global Insight. That's something a longer-term stimulus package could help guard against. Raising the loan limits should allow a larger pool of borrowers to qualify for lower-cost mortgages or to refinance existing mortgages, something that has been difficult to do since mortgage lenders pulled back from nonconforming loans. "This, along with the fact that interest rates have dropped, will give a big kick to the demand side of the housing market," said Nariman Behravesh, chief economist at Global Insight, an economic consulting firm in Lexington, Mass... But the plan means a major expansion of Fannie's and Freddie's already large role in providing funds and setting standards for American home loans. With the compromise, moreover, the administration is continuing a retreat from its efforts in the first half of this decade to scale down Fannie and Freddie and let free-market forces have more sway in the mortgage market. Major accounting scandals severely tarnished both companies earlier this decade. But they continue to exert political power, largely because builders and Realtors see them as a vital prop for the housing market and fiercely resist efforts to constrain them. Though the rise in the conforming-loan limit is supposed to be temporary, Congress may find it tough to reverse it in the face of warnings by builders and Realtors that such a move would cause another drop in home prices. Home builders cheered the likelihood that the stimulus package would raise the conforming-loan limit, saying it could make it easier for buyers to purchase higher-priced homes and may reduce the glut of homes in several costly markets. "It's a shot in the arm to the market," says Dom Cecere, chief financial officer at Los Angeles-based KB Home, one of the nation's largest home builders. "It's going to spur people to move up to a more expensive house, and that's going to get the new and used markets moving again." And that's a good thing -- but only if these new loans are made to people who are willing to verify income, don't lie on their applications and are made to sworn that they fully understand the mortgages for which they're signing. Homeowners with jumbo mortgages also pay higher interest rates because, with no guaranteed secondary market for the loans, lenders take on more risk, and charge borrowers more for doing so. For instance, the interest rate difference between loans that fall within the cap limit and jumbo loans was more than 1 percent on Thursday -- 6.39 percent compared with 5.30 percent, according to Bankrate.com. On a $500,000 mortgage, the difference is about $350 a month. "The 1 percent drop is a huge factor," said Yun. "In California, it could create a mini-boom." Before the stimulus package was announced, analysts including Merrill Lynch had come out with dire forecasts for housing markets over the next couple of years. But, said Mike Larson, a real estate analyst with Weiss Research. "[the raise in loan limits] could remove some of the inventory overhang and alter the buyer psychology a bit. Right now they're still waiting for prices to fall." Yun added, "There's a lot of pent-up demand in the market. This will boost confidence among these potential buyers, and some of the people on the fence will start buying." Of course there's the obvious question remaining: does this only postpone the eventual day of reckoning for home prices which have become unaffordable for those without equity to trade up? Is this an election-year ploy to shift the misery until 2009 or will this really help soften the downturn? Rudy Giuliani: Opposes congressional intervention. Favors private-sector action to prevent foreclosures. Says lenders and their investors should take responsibility for making risky loans. Prefers that lenders renegotiate mortgages with borrowers. Mike Huckabee: Opposes a bailout of the lending institutions or their investors. Also opposes a bailout for borrowers caught in the crisis. Says lenders should be pressured to refinance loans so that rates rise more slowly and affordably. John McCain: Generally opposed to federal intervention but says the crisis may require measures to limit the fallout and to assist the truly needy. Wants more consumer education and more rigorous regulatory enforcement. Ron Paul: Says government intervention in the financial sector created the crisis. Believes the Federal Reserve's loose monetary policy and federal mortgage programs, such as Fannie Mae and Freddie Mac, have distorted the normal working of the housing market. Mitt Romney: Opposes a broad federal bailout, but says the federal government should refinance some loans at more stable rates. Would help middle-class Americans meet their mortgage obligations by eliminating the income tax on interest, capital gains and dividends. Hillary Rodham Clinton: Would expand government-lending programs to stabilize the mortgage market and set up a $1 billion fund to assist state programs that help at-risk borrowers avoid foreclosure. Wants laws to crack down on unscrupulous mortgage brokers and abuses in mortgage lending. John Edwards: Supports the Bush administration plan for lenders to voluntarily freeze rates but says it's not enough. Would create a Home Rescue Fund to help families move into affordable mortgages and allow bankruptcy judges to rewrite mortgages on family homes. Would seek to prevent a future crisis by passing a strong law against predatory lending and by creating a new federal regulator for the financial services industry. Barack Obama: Supports comprehensive legislation to combat fraud and abuse in the mortgage industry. Proposes a fund to help people refinance mortgages and offset the cost of selling homes. Would waive certain federal, state and local income taxes that result from the sale of homes to avoid foreclosure. ...(La Tishia) Morris went to the store across the street from the West Lane home she rented to buy a pack of cigarettes. When she came back, a notice to vacate was duct taped to her fence. Her landlord had been default in payments, the house was in foreclosure, and Morris was told to leave. The mess reached the house on West Lane in the middle of November when the first letters arrived. They were addressed to the landlord, from whom Morris and her family had been renting the house for almost a year. Morris said she tried to reach her landlord, couldn't, then set the letters aside. None of the mail was addressed to her, so she didn't open it. A month later, a real estate agent came to the door and told her the house was in foreclosure, Morris said. The agent told Morris she likely would have to move. But when Morris finally was able to contact her landlord, he told her he had caught up on his payments. He said she could stay, and she took his word for it. Then on Jan. 3, she came home to a five-day eviction notice. Tenants who refuse to leave face an eviction lawsuit, for which they usually have no legal defense. The impact of an eviction on a tenant's ability to find future housing can be devastating. No law prevents a future landlord from automatically rejecting tenants with evictions on their record, even when those tenants were the innocent victims of a foreclosing bank. There are some notable exceptions, however, to this grim scenario. Tenants who participate in the federally financed Section 8 program will see their leases survive, as will tenants in New Jersey, New Hampshire, and the District of Columbia. In these states, new owners cannot evict lease-holding tenants unless the tenants have failed to pay the rent or violated any other important lease term or law. Tenants in other states who live in cities with rent control “just cause” eviction protection may also be protected. And, while it doesn't necessarily make sense to risk vandalism to vacant properties, it's clear that lenders have no interest in becoming landlords, plus they think that properties without tenants sell faster. That's why some have come up with a "cash for keys" program, in which they offer money to borrowers -- and sometimes renters -- to vacate within a certain time period in order to save them the costs of eviction. Still, it's not a lot of money -- typically $500 to $2,000, although desperate lenders with many foreclosed properties on their books may offer more -- and it's often the responsibility of the tenant to track down the lender to negotiate an exit strategy. Speaking from experience, I've been on the landlord side of an eviction, and I would have tried just about anything (and did) to avoid the time, stress and costs of an eviction. Small claims court is a perfect place to bring such a lawsuit. The tenant can sue for moving and apartment-searching costs, application fees, and the difference, if any, between the new rent for a comparable rental and the rent under the old lease. Though the former owner is probably not flush with money, these cases won’t demand very much, and the judgment and award will stay on the books for many years. A persistent tenant can probably collect what's owed eventually. Since that's clearly not an optimal solution, perhaps some legislative reforms are in order, such as HR 3915, The Mortgage Reform and Anti-Predatory Lending Act of 2007, that's awaiting approval by the Senate. If this issue is important to you, this might be a good time to call your Senator and voice your opinion. To date, U.S. officials haven't followed any of the advice they so readily dispensed to others. They have tried to aid troubled banks. They have slashed interest rates to help the struggling housing and stock markets. They have made it clear that they will go to extreme lengths to keep the American economy out of recession. But if the current prescription fails to provide long-term relief, what comes next? The answer, many economists say, could be that old castor oil. If Fed rate cuts are blunted by housing market weakness and banks' hesitation to pass along interest savings, and new public spending or tax cuts end up mired in politics or arrive too late, there may be no other solution to the nation's troubles than perhaps the most painful one: time. One day after the Fed slashed its benchmark interest rate to head off a possible recession, a small minority of economists warned on Wednesday that the central bank was in danger of invoking the same remedies that it did after the bubble in dot-com stocks burst seven years ago. Mr. Posen of the Peterson economics institute predicted that the Fed’s new policy of lower interest rates would provide “too much rather than too little stimulus” and help push inflation noticeably higher in 2009 and 2010. Time to start buying foreclosed properties? "The education of Ben Bernanke"
BofA a White Knight for banking regulators?